The years between 1875 and 1915 have often been referred to as the Age of Empire. 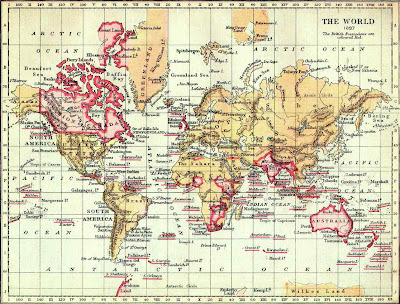 Many nations sought to expand their sphere of power and wealth by slicing the world up into colonial regions. Of all the nations involved in this "imperialism," as the term came to be known--the United States, Russia, Belgium, Japan, Italy, the Netherlands, France--the most nation with the largest empire was Great Britain. Queen Victoria celebrated her Diamond Jubilee in 1897, and at that time, one quarter of the world's entire population lived within the confines of her Empire. How was it that Great Britain came to dominate the global political landscape? There are many answers, yet one factor cannot be ignored: the British soldier. If a young Englishman wanted to see the world, he had no better option than to either purchase a commission for or enlist in one of two branches of the British military: the Army and the Navy. In some cases, as (somewhat disastrously) in India, soldiers might be recruited from the indigenous population, but many of the soldiers came from Great Britain. Most men who served spent the majority of their service outside of England. They might be posted to India, Egypt, Fiji, Sierra Leone, Canada or the Virgin Islands. But no matter where a British soldier might find himself, he was taught above all that Britain, and the British way of life, far surpassed anything any other country or populace had to offer. Military posts recreated enclaves of Englishness, particularly in the officers' quarters, and discouraged soldiers from "going native" and mixing with indigenous cultures and people. Officers held the most glamorous positions within the imperial army. Commissions were purchased--often for younger sons of the aristocracy--and the price varied depending on the regiment. A cavalry posting ran up to £800 and could include overseas duty as well as short sojourns in England. If an officer was ambitious, he would request a regimental posting in some hazardous and unstable part of the Empire. This ensured he would be promoted far more quickly, and cheaply, than buying a promotion. But officers comprised a small percentage of the British military. Enlisted men provided Great Britain with the necessary manpower to maintain its massive Empire. In 1870, the basic period of enlistment was twelve years. A young man might join a regiment at eighteen, but boy-soldiers were not uncommon, signing on at age fifteen and then formally joining three years later. Enlisted men were not a respected group, often disdained by the general British public. They were drawn from the ranks of the rural poor, and sometimes criminals were offered the choice between gaol or military service. A soldier's life meant hardship: poor pay, little privacy, severe discipline, endless drills, occasional hostile natives and exposure to exotic ailments. Still, for many men, "taking the shilling" offered more opportunity than struggling to eke out a living in an increasingly industrialized England. Not all enlisted soldiers suffered. Some rose in the ranks through exemplary service and learning skills such as telegraphy--an important ability when the British Empire relied heavily on telegraphs to keep abreast of latest developments. Small numbers of enlisted men were permitted to take a wife, and noncommissioned sergeants could also marry. Children of these marriages frequently became soldiers themselves. 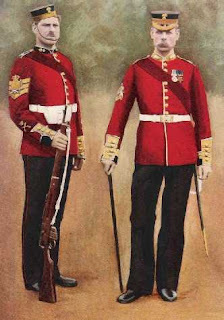 Two British soldiers appear in my upcoming "Blades of the Rose" series. In "The Undying Heart," part of the HALF PAST DEAD anthology (Brava; 01/2010), Major Samuel Reed is a veteran of the Crimea. Gabriel Huntley, the hero of WARRIOR (Zebra; 09/2010), is a rare officer who rises through the ranks, posted in both India and what would be known as Ethiopia. Both of these men are profoundly shaped by their experiences serving in Queen Victoria's army. I was fascinated to discover their stories, as well as the stories of the thousands and thousands of military men who helped create the massive and powerful British Empire.